There are 18 acres of city-owned land in the heart of Boston. What should happen to it? 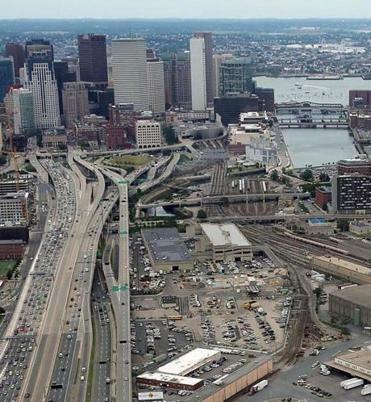 Mayor Martin J. Walsh is eager to turn the city’s vast public works yard along the Southeast Expressway over to a private developer, possibly paving the way for a soccer stadium. But first he has to convince city Councilor Michelle Wu that it’s a good idea. Wu worries that the Walsh administration is moving too quickly to sell what she considers a valuable asset. She has the support of environmental activists and others who view the Frontage Road property — close to Fort Point Channel — as a key part of the city’s efforts to plan for storms and rising sea levels. The issue could come to a head on Thursday, when the administration’s request to declare the 18-acre property surplus land is heard by a City Council committee that Wu chairs. Walsh set the stage for this potential tug-of-war over the summer by deciding to put up for sale the parcel — which includes truck storage, a salt pile, a parking meter repair shop, and the city’s dreaded tow lot. If the mayor gets his way, it would be transferred to the city’s public facilities commission. Eventually, the Boston Planning & Development Agency would take control and oversee a sale through a bidding process. The public works yard, along with the Widett Circle area to the south, first attracted attention during Boston 2024’s failed Olympics bid. (The food wholesalers that own most of Widett Circle have already put their property on the market.) The area would have been home to the main Olympic stadium, and then redeveloped after the Summer Games were over. After the bid soured in 2015, Walsh vowed to pay closer attention to planning for the future of the parcels. 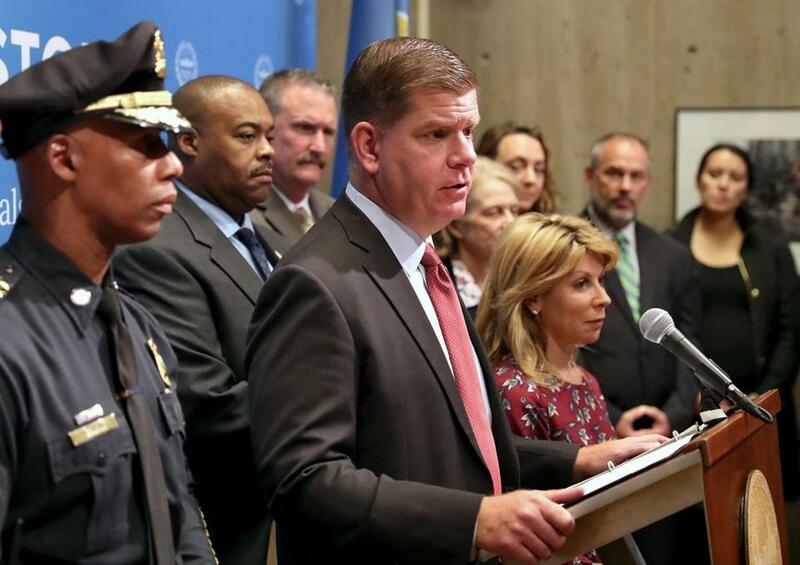 In an interview, Mayor Martin Walsh (center) stressed the public works yard’s potential given its proximity to the MBTA’s Red Line and to downtown. In an interview, Walsh stressed the public works yard’s potential given its proximity to the MBTA’s Red Line and to downtown. Looming over the City Council debate is the possibility that a sale to a developer could bring about an end to the Kraft Group’s yearslong hunt for a soccer stadium site in or around Boston for the New England Revolution. The Revs currently share a home with the New England Patriots at Gillette Stadium in Foxborough, which seats about 66,000 people. But the soccer matches draw much smaller crowds than Patriots games, and many Revolution fans would prefer a more modest venue that’s configured for soccer. The tow lot and the land around it have long been considered a possible site for a soccer stadium. Properties in Somerville, Revere, and Roxbury also have been considered over the years. The Kraft Group appeared close to reaching a deal for the UMass-owned Bayside Expo property in Dorchester near South Boston. But those plans fell apart last year after politicians in those neighborhoods raised concerns about congestion. Many in South Boston haven’t forgotten the “megaplex” proposal floated in the 1990s, that would have included a Patriots stadium near Summer Street. But Walsh said if a much smaller stadium is built by the Expressway, it wouldn’t cause heavy traffic in the neighborhood because it would be located at the edge of Southie, near public transit and highway ramps. City Councilor Ed Flynn, who represents the area, declined to say whether he would support a stadium. But he is raising concerns with the Walsh administration about potential traffic caused by a major development on the site. The administration would like to use at least some of the cash generated by the property’s sale to help pay for the relocation of at least some of the aging public works operations. 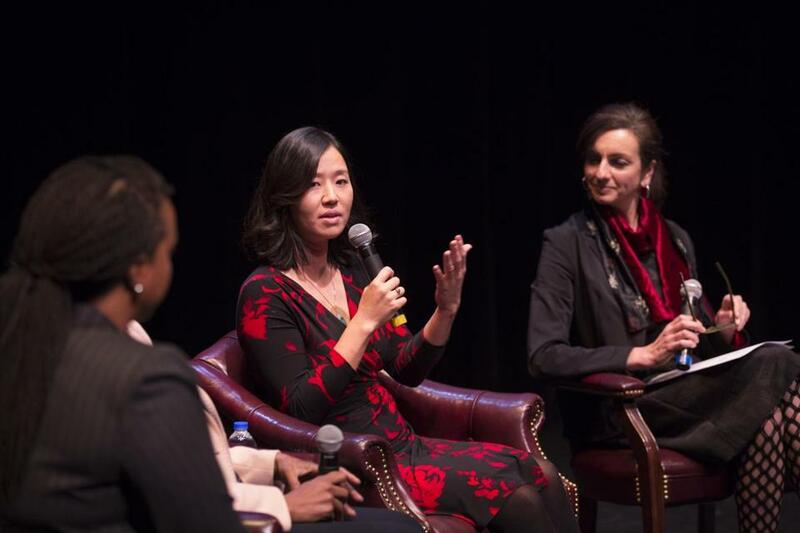 Michelle Wu (center) argues that the fate of the Frontage Road property should be determined by what’s best for the city, not necessarily by the amount of money that could be raised. Wu argues that the fate of the Frontage Road property should be determined by what’s best for the city, not necessarily by the amount of money that could be raised. She points to the sale of the shuttered Winthrop Square garage to Millennium Partners as an example. That deal is expected to raise more than $160 million for the city, but she said the council didn’t play enough of a role in overseeing the garage site’s sale. “The stakes are so much higher with this parcel,” Wu said, referring to the Frontage Road land. Wu presided over a tame hearing on the issue in August, during which the only speakers were from the administration and the council. The soccer stadium wasn’t even mentioned. Thursday’s session will be different. Wu has invited activist groups to attend and share their concerns about the parcel’s fate. Emily Norton, executive director of the Charles River Watershed Association, said her group plans to make a presentation about the property’s flooding potential and its long-term development risks. Craig Altemose, of the environmental nonprofit Better Future Project, is among the environmentalists who will argue the property should be allowed to revert back to its former state — wetlands. But he says building affordable housing on part of the land could have environmental and social benefits, by reducing the commutes for some middle-class workers.